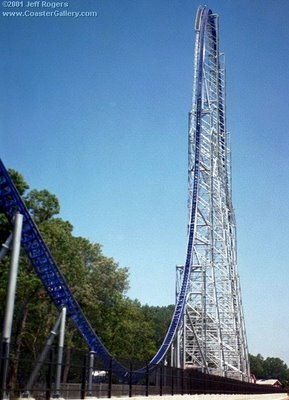 Jesus The Radical Pastor: May I Be With the Force...Millennium Force! I'm at a father-daughter (and boyfriend) dance today...sort of. I'm at Cedar Point in Sandusky, Ohio with my daughter, Shamar, and her friend Evan. I'll be riding the world's top-rated roller coaster "Millennium Force" (not to be confused in any way with Tribulation Force of the "Left Behind" series of books). This thing is real! It's my Father's Day gift from my daughters and Shamar's 23rd birthday gift from Evan. Her birthday is today. Dang, John, didn't your mama raise you to fear God and take care of yourself? Bones are hard to replace. Looks too breathtaking to be much fun! Since my mid twenties I've gotten sick on swings, sitting in back seats of cars or passenger seats with folks who like to ride the brakes. When I saw the picture I had to turn my head to keep vertigo from breaking loose in my head. The only amusement park ride I am able to participate in is the merry-go-round. I'm your basic fraidy-cat. I don't think my body can take very well roller coasters anymore, especially anything like that one! You must join me next year for a day at Cedar Point. As a veteran (see latest post), I can guide you into the adrenaline-drenched joys of roller-coasters. Oh no! My fingers are going out of control and typing by themselvses. I am NOT responsible...Wimps. You got game as they say in the 'hood.